On the third day of the Republican National Convention, Indiana Gov. 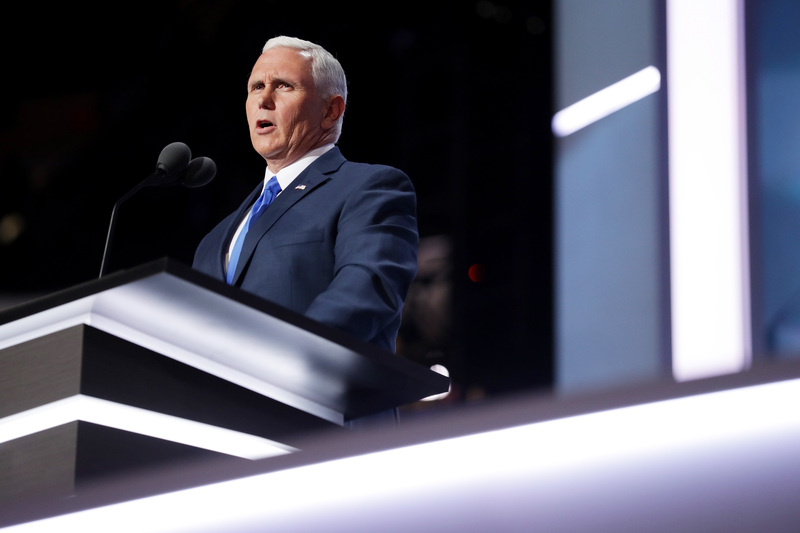 Mike Pence officially accepted the GOP's vice presidential nomination. His speech made it clear that he would retain his brand of conservatism, and like many other party leaders, he emphasized his support for law enforcement. More explicitly, this one quote from Pence's speech had "blue lives matter" undertones, though he tried to mask them with attempts to appeal to voters of color. This isn't anything new for the RNC, where Congressman Steve King made white supremacist comments and Sheriff David Clarke, Jr. — a Democrat — declared that "blue lives matter," a sentiment that was echoed throughout the convention. It's been a heartbreaking time for the women and men in our law enforcement community and in this time of great testing for them, let's let them know, here and now, all across this country, we will always stand with those who stand on the thin, blue line of law enforcement in America. There's nothing wrong with expressing support for law enforcement, as Pence did. But the issue is that he did not express a similar sentiment in solidarity with black people, making it clear whose lives matter to him. This isn't necessarily surprising coming from a governor whose policies suppress the rights of women and LGBTQ folks, but it's still important to point out. Pence is talking about the same Donald Trump who accused Black Lives Matter activists of instigating the killings of police officers. He's talking about the same Donald Trump who wants to build a wall at the U.S./Mexico border. The same Donald Trump who wants to impose a temporary ban on Muslims entering the country. The Donald Trump who egged on violence at his rallies. Who received an endorsement from a Ku Klux Klan grand wizard. So when Pence praises Trump and says that his party stands with law enforcement, he cannot justifiably insist in the same speech that his party represents "equality of opportunity." Pence didn't have to say "blue lives matter" to make it clear whose lives he actually values — and it's certainly not the lives of black people.